What is the Costa Rica Government Like? What type of government does Costa Rica have? Is Costa Rica a democracy? What is the Costa Rica government like? The following information should give anyone who is interested in owning or investing in Costa Rica the peace of mind that it is a great place to own real estate, to visit or to retire in. What type of government does Costa Rica have? Is it stable? Costa Rica is a democracy. Their current form of government is based off the 1949 Costa Rica Constitution that was written in response to World War II and a small Civil War where 2,000 people died (or about the same number of shooting victims every year in Chicago, IL, USA). The Constitution of 1949 abolishes the military, provides public education, public healthcare and provides all the same rights to foreigners as citizens – including the ability to own fully titled property (unlike Mexico)! In fact, because Costa Rica does not have a military (or air force), the government is free to spend more money on education. Costa Rican’s are some of the best educated people in the world with literacy rates over 95% and an increasing rate of bilingual (English and Spanish) citizens. I have noticed a big difference in the number of people who speak English over the past decade. The people elect the President through a popular vote. This makes sense given the geographic size of Costa Rica (size of West Virginia) and its population ~ 5 million. A piece of history: when the United States Constitution was signed in 1787, the population in the USA was around 4 million people. Costa Rica is home to one of the longest lasting democracies in the world. Costa Rica’s independence began in 1848 when Dr. Castro Madriz signed documents separating Costa Rica from the Central American Federation, and formed the Republic of Costa Rica. where there is only two political parties that influence policy, in Costa Rica there are over a dozen. In fact, for the the 2018 federal elections, there are 16 political parties!!! This means that when the people of Costa Rica are frustrated with the policies being made, they don’t simply sit around and complain, they actively form new parties and then actively campaign for support. Costa Rica has a unicameral Congress. This simply means they have one group of people in their Congress. By way of comparison, the United States of America has a bicameral Congress (two chambers in the legislative branch: Senate and the House of Representatives). Costa Rica’s Congress has 57 members (called ‘diputados’) and they are the highest ranking members of the legislative branch. I have visited the Congress several times and enjoy seeing democracy in action. Nick Halverson and President Oscar Arias when Arias was President. We spoke for about 30 seconds, had a photo taken with him, and he moved on. I was amazed how accessible, easy going and friendly he and his team were. His English was perfect – he had taught at Oxford University after all. The second experience I had was with a former President who I met at a restaurant during a private party. He didn’t have any security with him and if you didn’t know who he was, you would have thought he was just another patron. I love politics, so I took the opportunity to get a photo with him too! Our Project Manager Hanz Cruz is currently (2017) the President of San Isidro del General, Perez Zeledon, San Jose, Costa Rica, ‘Consejo’ (City Council). In this capacity he routinely has meetings with high-ranking officials, and recently had a meeting with the current President of Costa Rica, Luis Guillermo Solis. During the meeting they discussed numerous topics, including tourism in the area. 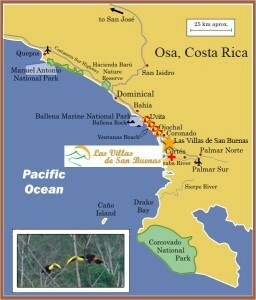 Costa Rica is a wonderful place to live, with an extremely strong democracy, making a perfect place to own real estate.